Competitive colour t shirts printing, full colour sleeveless t shirts printed at trade print prices and dispatched on a next day courier service to Scotland. Competitive sleeveless t shirts printers of sleevless colour t shirts, printed at very competitive printing prices. Competitive UK sleeveless colour t shirts printing. When ordering low-cost sleeveless colour t shirts for next day delivery within the United Kingdom. We can effectively design your colour T shirts printing prices include delivery. We will use a next day courier to dispatch your printed sleeveless colour t shirts. Competitive colourt shirts printers delivering high quality colour sleeveless t shirts to Scotland. 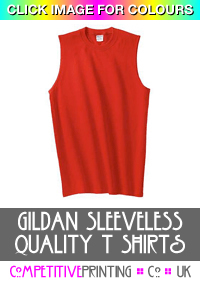 One colour two sided sleeveless t shirts. Sleeveless t shirts printed with one colour on front and back. Two colour two sided sleeveless t shirts. Sleeveless t shirts printed with two colour on front and back. Three colour two sided sleeveless t shirts. Sleeveless t shirts printed with three colour on front and back. Four colour two sided sleeveless t shirts. Five colour two sided sleeveless t shirts. Sleeveless t shirts printed with five colour on front and back. Six colour two sided sleeveless t shirts. Sleeveless t shirts printed with six colour on front and back. How to upload PDF artwork for your printed colour t shirts or commission our designers. Design and artwork. Let our creative design team design you effective professional looking artwork for your colour printed sleeveless t shirts. Free colour t shirts printing artwork checks or use our low-cost design and artwork service. We offer a competitive nationwide sleeveless colour t shirts printing service to and the rest of the United Kingdom.